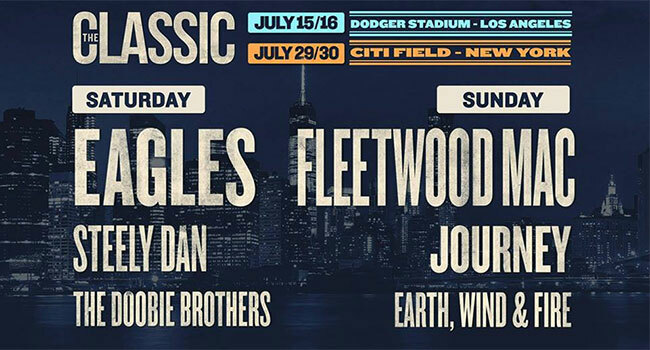 This year's super festivals of classic rock, Classic West and Classic East opened on Saturday with their West Coast show at Dodger Stadium in Los Angeles. 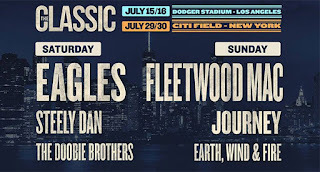 The Doobie Brothers opened day one with a fifteen song set that concentrated on their pre-Michael McDonald days with the exception of Takin' It to the Street, which was originally sung by McDonald on the album of the same name, and The Doctor from the post-McDonald album Cycles. Steely Dan was next up with twelve songs from their 70's and early-80's catalog, skipping anything from their two new century albums, Two Against Nature and Everything Must Go. Fagan was on his own as Walter Becker was ill. Larry Carlton filled in. Finally, the Eagles closed out the day, opening with the acapella Seven Bridges Road, all members on the stage including the newly added Vince Gill and Duncan Frey, the son of the late Glenn Frey. Those two were given the spotlight a number of times over the course of the night. Gill took lead on Take It to The Limit, Tequila Sunrise, Lyin' Eyes and New Kid in Town while Duncan was in front for Peaceful Easy Feeling and Already Gone. The rest were sung by the familiar leads Don Henley, Timothy B. Schmit and Joe Walsh. There was one big surprise guest for the evening when Bob Seger hit the stage to sing Heartache Tonight which he wrote with Frey, Henley and J.D. Souther. Whether this and the Classic East festival are the end of the Eagles is unknown. Henley told the crowd "In case this is our last dance, we want to thank all the fans of Southern California".